The Evolution of Bruno Littlemore is a highly intelligent and provocative piece of literature that is not for the faint of heart. Its pages are filled with wit, humor, sadness, mortification and ingenuity. The imagery between Darwinism and Creationism is detailed in this highly imaginative tale. Bruno Littlemore, the narrator of the story, is a chimpanzee who has learned the ability to communicate, not with his hands, but with his voice. He is articulate, knowledgeable and extremely well-read on an academic level while maintaining his animalistic tendencies. Bruno is in love with all things human and after being "rescued" from the zoo by Dr. Lydia Littlemore, he comes to realize that he could never go back to that kind of life. After spending many years as a test subject for a research department at the University of Chicago, Bruno goes to live with Lydia and they fall in love. Their life borders on the idyllic and for years they grow together, under the radar, until the headaches that Lydia suffers from become unbearable. After heading back to the "real" world, their lives begin to unravel and Bruno is forced to flee for his life. He meets many interesting characters along his journey, who help to shape and mold him to be a better "person". However, all things come full circle and Bruno decides to go back to his past in order to correct all the wrongs done to him. Bruno shares with us his passions, his loves, his reasons for being and the similarties between his species and humans. Even though there were a few passages that will stay with me forever, I loved reading his story and for a first time author, Benjamin Hale, has written a remarkable piece that I would recommend to others to read. It has moderate to heavy expletives, scenes of morbid violence and sexual intimacies. 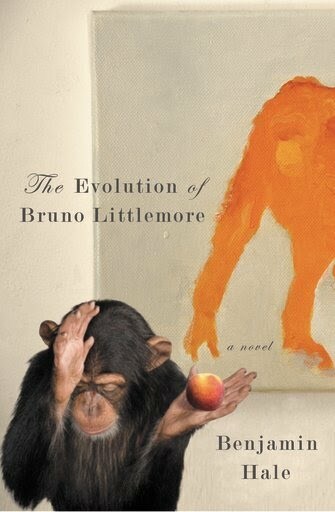 Bruno Littlemore is quite unlike any chimpanzee in the world. Precocious, self-conscious and preternaturally gifted, young Bruno, born and raised in a habitat at the local zoo, falls under the care of a university primatologist named Lydia Littlemore.